There are three key elements that are important to make any weight loss exercise program successful. These elements are safety, effectiveness and enjoyment. Safety: The “No pain, no gain” theory is a myth. Avoid any weight loss exercise that causes pain or undue discomfort. If pain occurs in the neck or chest area, stop exercising and if necessary, seek medical attention. General muscle soreness is another matter, especially for the beginner. You can expect some soreness but it need not be excessive. A personal trainer will design an weight loss exercise program for you and your current fitness level. As your fitness level increases, your program will be adjusted to keep up with you. Too much too soon will only undermine your efforts. Using proper form, technique and avoiding high-impact will keep your exercise program safe. A strain in your lower back, shins, calves, ankles and knees are predictable results of improper form. Repetitive, jarring movements should be avoided for general fitness. If you feel a strain, please let your trainer know. We don’t always know if you don’t tell us. Don’t bounce or force stretching movements. Quick, pulsing movements while stretching can result in muscle strain and tears. Static movements that gradually extend muscles through the full range of motion until you feel resistance is the stretching to use for general fitness. Stretching will also decrease the likelihood of injury and soreness. Effectiveness: Effective weight loss exercise does require effort, but those who say it must hurt are wrong. The level of exercise is determined by your fitness level and goals. The fuel source for the body during low to moderate aerobic exercise is fat. If burning excess body fat is your current fitness goal, stick to the recommended exercises and intensity levels to receive maximum results. As your fitness level increases, so will the formula for your program. Intensity, weight, repetitions and rest periods will all be adjusted as you progress. Proper warm up before exercising and cool down afterward is essential to avoid injury and achieve peak performance. Enjoyment: It has been said that nobody will exercise just because it is good for them. We need additional motives or goals that mean something to us and that will come as a result of regular exercise. It is important to identify your goal so your exercising effort is focused on your goal(s) to keep motivated. The more motivating your weight loss exercise becomes the more enjoyable it will be. More enjoyment produces more consistent and greater results! So how do you make exercise fun? First of all, stop thinking of it as exercise and start thinking of it as play. You remember play: those activities you enjoyed as a child. Turn exercise into play! Usually, play involves interaction with friends and variety. 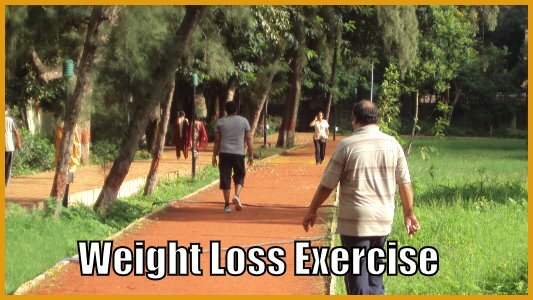 For Your Weight Loss Exercise Program Click Here!